At Royal Palms Villa, you can spend a day playing tennis, then return to a gated community knowing that you’ll get the privacy you desire. The villa works well for two couples to share, and the screened porch offers a great place to enjoy your readings from the book library, or play a board game after enjoying barbeque from the outside grill. Ceiling fans help keep this open villa cool and comfortable, and the bold colors keep it alive and vibrant. Modern amenities and weekly maid services allow for easy upkeep at this villa while you vacation. With Royal Palms villa, you can spend time golfing, then play in the pool when the day is at its hottest. Royal Palms Villa, set within the exclusive Estate Shoys gated enclave, offers ocean views and privacy for the most discerning of villa guests. This uncommonly refined and comfortable residence, set on nearly an acre of landscaped grounds, overlooks the greens of the golf course and the ocean beyond. It is sequestered within the gated community of Shoys, adjacent to St. Croix’s renowned Buccaneer Hotel Resort. The driveway, lined with royal palms, winds through masses of colorful bougainvillea to the villa’s gated entryway, shaded by tropical palms and a pergola, which welcome you into the quiet cool seclusion of Royal Palms. Professionally decorated, the fully air-conditioned living, dining, and powder rooms, the kitchen, and both air-conditioned king bedroom suites all border a covered gallery that additionally is furnished for living and dining. All rooms are comfortable and provide several indoor and outdoor living and dining areas. The Great Room is spacious, comfortable and tastefully decorated in tropical style. The gourmet kitchen is on one side of the Great Room, and on the other side, French doors open from the Great Room to a large screened lanai, an additional living and dining area, where fully-screened arches provide a view of coconut palms, green lawn, and the lagoon beyond. The two king bedroom/bath suites are comfortable; the master suite features a unique hand-carved four-poster king bed. Both suites are finished in the soothing colors of the Caribbean, accented with vivid punches of tropical color. Even the powder room has a painted wall mural by a well-known local artist. Royal Palms Villa, with its unique collection of art, photographs, and stylish designer furnishings, is well equipped. From the gallery, arches with boughs of bougainvillea frame the pool, sun deck, and Caribbean beyond, with 180-degree azure sea views to the north, east, and west. Inside and out, tiled floors with brick detail add to the charm of this villa. The professionally landscaped gardens are colorful and well-manicured. Complete privacy is yours at Royal Palms Villa, but yet you are less than a minute’s drive from The Buccaneer Hotel’s golf, tennis, and its two beaches, as well as Shoys’ own white sand beach. 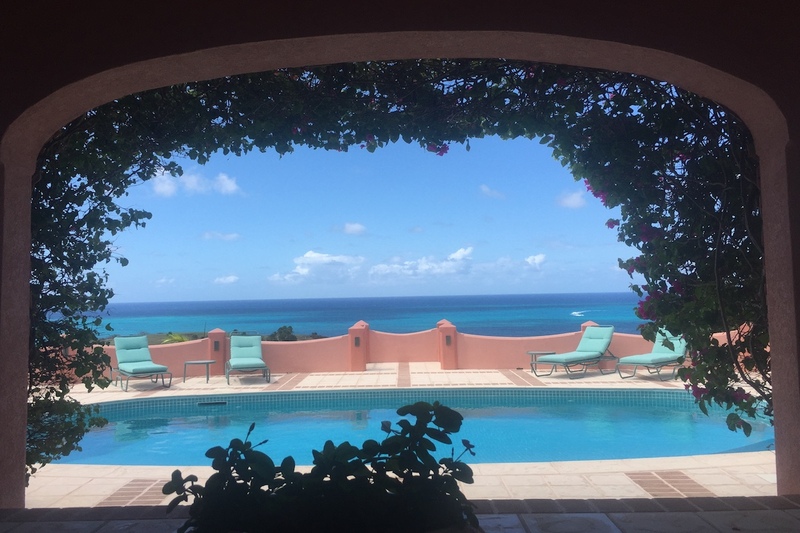 Add in the dining to be found on St. Croix, and this is the ideal villa for those seeking the very best within an unforgettable setting of elegance total privacy. Access to the Buccaneer beaches is unrestricted (by law) and golf, tennis, spa, treatments, etc. are available on a pay for play basis. Drive (one minute) to two beaches at the Buccaneer Hotel Resort or to Shoys' own white sandy beach. My family and I enjoyed our stay at Royal Palms Villa. This home is comfortable and elegant with spectacular views. Shawna at WhereToStay.com anticipated my every need. She is responsive and lovely.